The wife of a former senior Apple engineer has spilled the beans on Apple's transition, and it's a sweet and surprising story. The first years of the last decade posed a problem for Apple hardware: it had a new, futuristic operating system but was being left behind in the performance race. CEO Steve Jobs had fallen out with his chip supplier Motorola, and Apple's engineers were obliged to run antiquated chips at higher frequencies and higher temperatures – essentially overclocking the parts. The CPU was running far faster, around 10x faster, than data could fill it from the bus. 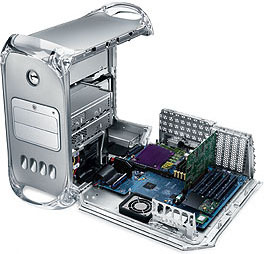 Apple then turned to IBM for help and introduced a more modern architecture in 2003, with the G5. But these chips required elaborate cooling and weren't appropriate for the rapidly expanding notebook segment. But with its acquisition of NeXT, Apple had an ace up its sleeve. It not only acquired NeXT's CEO, Steve Jobs, but had also swallowed NeXT's operating system: which had been ported to run on Intel x86, SPARC and PA-RISC chips too. This later formed the basis for Mac OS X. The problem was this had last been marketed in 1995, and was decidedly crufty - hence the long delays in getting an overhauled Mac OS X out of the door. Perhaps the 'fat binaries' which contained native code for each architecture would come to Apple's rescue? Apple shipped its first Intel Macs in 2005 and completed the switch in 12 months, in one of the slickest and most successful migrations in history. There would be no 'Osborne Effect' and Hackintoshes wouldn't remain a hobby, with no significant impact on Apple's market share. The secret operation was codenamed "Marklar". The 'Marklar' moniker – originating from the spoof alien race in South Park – emerged in October 2002, thanks to Nick dePlume (editor of former Apple rumour website Think Secret, shut down in 2008 after a legal battle with Apple) as well as former eWeek editor Marc Rothenberg. So smooth was the transition, pundits assumed Apple must have maintained Marklar in its labs from the moment it acquired NeXT in 1996. Now, from a post by Kim Scheinberg, wife of Apple engineer John Kullmann, we now know that this wasn't the case. Three years after Apple acquired NeXT there was no Intel port. Kullmann had began the project in his own time in 2000, something he was able to do because he had been given special dispensation to work from home. For 18 months it remained a one-man project, tolerated rather than encouraged, and in that time according to Scheinberg, only six people within Apple knew about it. Finally it acquired a couple of more engineers early in 2002 and serious staffing late that year. It's a lovely story, and shows how an enterprising lone engineer can create something of huge importance, away from the deadlines and bureaucracy of the main job. There is actually a spooky parallel with Microsoft. In 1987, a summer intern at Microsoft found a way of running the company's GUI-run time for MS-DOS in extended mode. Windows™ was then a joke, absorbing precious memory resources and with no developer mindshare and little use other than as a run time for Excel and Pagemaker. Microsoft's focus was on making IBM's OS/2 work, as very junior partner, and persuade a sceptical IT industry that they needed it. The intern's work allowed Windows to break the memory barrier and take on a few aspects of a real operating system. Microsoft didn't miss the strategic significance. So important things happen by accident, if you can allow the engineers a bit of slack. This was the thinking behind Google's early decision to allow engineers to work on their own projects, unsupervised, for 20 per cent of the time. Of course comparing what this has achieved (GMail) versus what Google has bought in (Earth, Android and everything else) isn't a great advertisement for formalised slacking off. We should point out that an important part of Apple's smooth migration of its market to Intel was actually Made In Britain. NeXT's 'fat binary' design allowed native executables to be created very quickly - but older Mac PPC programs still had to run on the new chips, somehow. Apple achieved this by licensing software developed at the University of Manchester and commercialised by its creators at a spin-out company Transitive, something we first revealed here at El Reg. Apple called this virtual CPU layer Rosetta, and it performed code translation at miraculous speed. So fast, many Mac users didn't realise they were running code designed for a completely different architecture. IBM acquired Transitive in 2008.